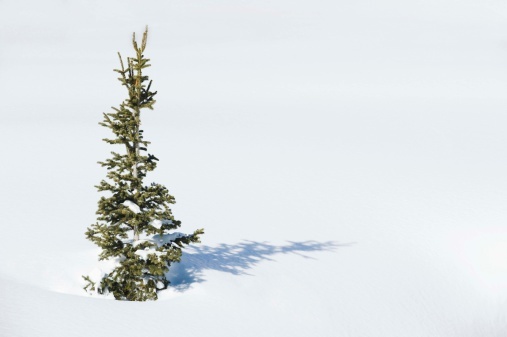 Trees serve more than purpose in the wild and in our own yard. Ornamental trees bring a blanket of color to the landscape during the spring and summer months, and other trees have vibrant fall foliage. Certain trees have an appealing allure that is distinctive among other species, but all trees provide us with valuable oxygen. Plant trees that grow well in your area. Most oak trees have a majestic appeal. Oak trees are robust trees that can reach a ripe old age. Oak trees posses some similar and distinctive characteristic between each other. 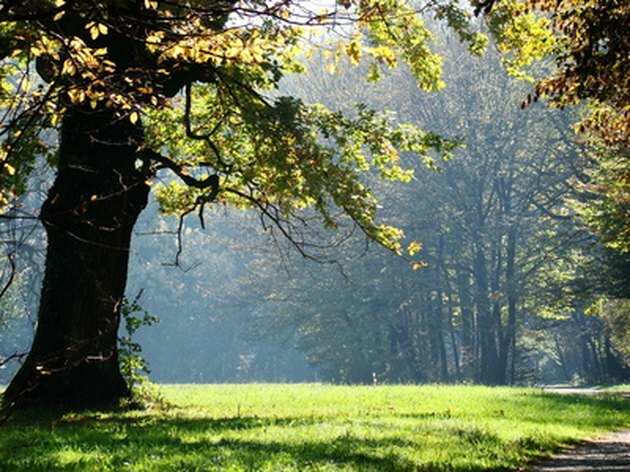 Most oak trees have dark to light green leaves throughout the majority of year. The colors usually change to deep orange, red or burgundy in the fall. The main differences are seen in the leaf shapes. The live oak tree produces a long oval-shaped leaf while the pin oak and Northern red oak have jagged leaves. The white oak also produces jagged foliage. 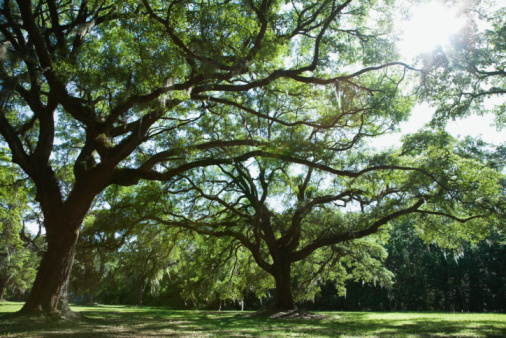 Most types of oak trees can reach heights of more than 100 feet and spread up to 50 feet wide. 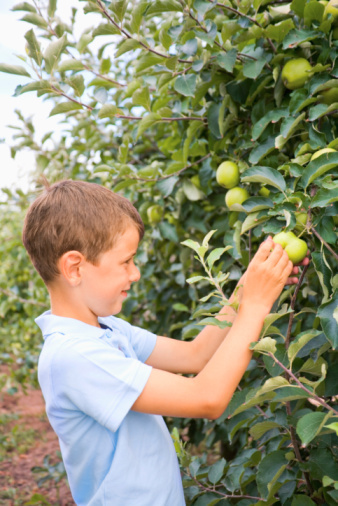 These trees enjoy full sun and can live in several types of soil such as wet, dry, well-drained or sandy. 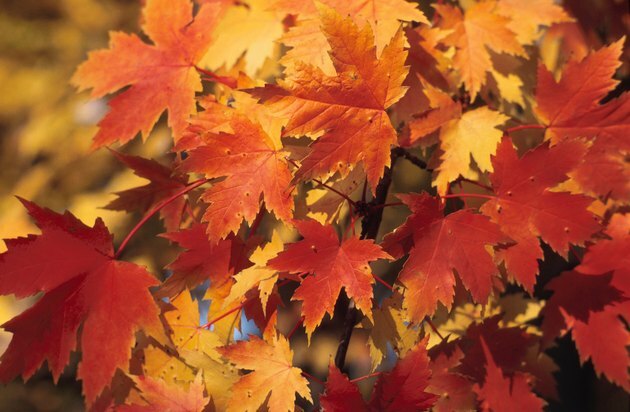 Maple trees produce different colored leaves, but they all have a similar star-like jagged shape. There are dozens of maple trees that have varying yet some similar characteristics. Most types of maple trees have light to deep green foliage throughout most of the year. The real changes are seen in fall and winter months. Some maples begin to show color changes in early fall. These trees produce bi-colored leaves of solid gold, red, brown or orange foliage. The red maple tree produces rough leaves that are light green for most of the year, but change to bright orange or red in the fall. Silver maple trees display yellow and brown leaves in the fall with silver underneath. The Norway maple tree displays a combination of yellow, gold, burgundy and green leaves in the fall. Many maples show a combination of many colors as the colder seasons set in. These trees enjoy full sun and well-drained soil. There are many different types of dogwood trees that bloom different colors but this one is blooming pink flowers. Dogwood trees are mainly used as ornamental landscape trees. There are hundreds of different species and hybrids, but most types grow well throughout the majority of the United States. 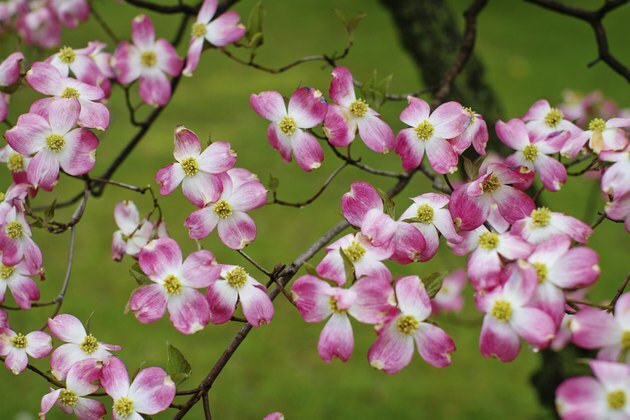 Dogwoods produce white, purple, pink, yellow and cream-colored blooms in the spring. The foliage varies greatly depending on the type of dogwood. Most dogwoods have deep green oval-shaped foliage. Some dogwoods lose all their leaves in the fall. Dogwoods have adapted to several different types of soils such as well-drained, sandy, loamy and moist. Sarah Ince started writing professionally in 2007. She has written articles about many topics such as holistic medicine, nutrition, herbs and pets. Ince's articles have been published in "Boating Times Long Island" magazine and "Community Connections News." Ince is working towards a bachelor's degree and she has taken professional writing classes such as Magazine Article Writing at Rio Salado college.